SIGNAL the FROG - Geocaching’s favorite mascot will be joining the circus this year. He will be out and about throughout the weekend. Find him and get a BIG high five and your picture taken with him. Big Prize Giveaway - We're doing it again! We're giving away GPS units, Tablets, and other fun prizes!! Be present at events and participate to win! Over $2500 in prizes up for grabs this year! Treasure Hunt - Tickets are $5 each and are limited to 750. For the first time, Treasure Hunt tickets are available to purchase through your online registration (pre-sale). We will be selling a limited number of tickets online, and the remainder will be available on site in the event store. A limited quantity is available each day when the store opens at 10am. Buy your ticket at the store first, then head to the treasure hunt area. You’ll use a metal detector to search for buried treasure. Every ticket wins a treasure-field exclusive MWGB trackable treasure tag! Some instantly win prizes! Dozens are entered into drawings for more prizes! Campsite Decoration Contest - Love to camp? Want to win some cool stuff? Then deck out your campsite. Preference is given to thematic campsites (theme/bird) - dress your site to impress. Top sites win great prizes! Honorable mentions win free camping next year! Friday Poker Run - Get out and see the surrounding area and play the poker run. Collect game pieces on your entry card and return to the event grounds by the deadline to take your chance at winning! Top 3 hands win GPS units and the worst 5-card hand wins one too. We will also be giving away another 100 prizes to other participants. More details to come! 10:00am - Venue Opens! C'Mon In! Find your campsite and set up! 10:00am to 5:00pm -  Event Store open, pick up will call orders and purchase event swag! 10:00am to 5:00pm -  Digital Logbook! Grab some props, strike a pose, and immortalize your time at Bash! Join us for the official kickoff party of Midwest Geobash 2018! Featuring FREE ICE CREAM* and bonfires! See the event page for full details on activities! 10:00pm to ?????? - [A51] Campfires transform to Area 51. Families still welcome but after 10pm adult beverages are welcome at Area 51 fires. 10:00am to 3:00pm -  Poker Run! sponsored by Pathtags.com! Pick up entry forms at 10am and complete a 7-stop poker run while caching in the local community. Drop entries at Spangler Arena  by 3:00pm sharp. No late entries. Partial entries accepted (i.e. 5 of 7 cards collected may still be the winner!). See full details here. 10:00am to 5:00pm -  Event Store open for you to pick up will call and purchase event swag! 10:00am to 5:00pm -  Lab Caches! Come enjoy some special caching fun onsite! 2:00pm to 4:00pm -  Live Poker Run results! Starts at 2:00pm, entries accepted until 3:00pm. The top 3 finishers and worst hand with at least 5 cards win a prize! Must be present for results to win! Prizes may include a GPS unit, Tablets, Amazon Echos, etc. Typically $150-$300 in value. This year we’ve added more prizes! 100 random participants will win special edition 2018 Poker Run trackable! 2:00pm to 7:00pm -  Flea Market is open with vendors showcasing their wares. 5:00pm to 7:00pm -  Set up and trade coins, Pathtags, whatever. Remember - no sales are permitted outside of vendor tables. Sponsored by Aura Design Group! Live poker action! Winners walk away with a ton of geocoins! Check out our forums to sign up for the game. If you are selected to play in the game, check in with Brian by 4:30PM. Seats become available to wait-list players at 4:40pm. Don't forget your buy-in! Join us for the start of our annual Tin Foil Hat Night! Tinfoil Hat Station! Come build an awesome tinfoil hat and wear it to the Area 51 fires! See the event page for full details. TINFOIL HAT NIGHT at Area 51! 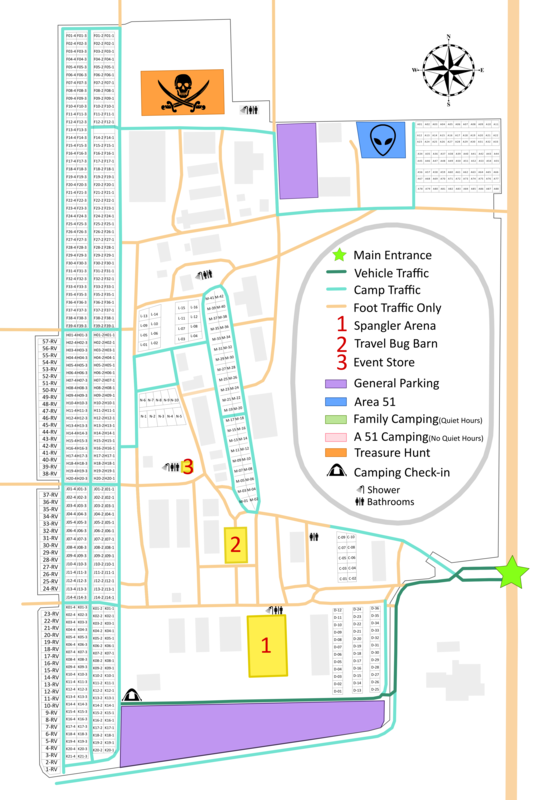 Make and wear a tinfoil hat to the evening fires at Area 51! GLOW NIGHT at Area 51! Bring your most festive glow items to Area 51! 10:00am to 3:30pm -  Event Store open for you to pick up will call and purchase event swag! All unclaimed will call items (excluding VIP items) will be made available for purchase for anyone in our event store at 2:00pm. 11:00am to 3:00pm -  Treasure hunt! See Treasure Hunt details at the top of this page for more information. 11:00am to 1:30pm -  Silent auction is open for bidding! Bid often, bid high - remember all proceeds go toward event expenses! 4:00pm to 6:00pm -  Set up and trade coins, Pathtags, whatever. 4:00pm to 6:00pm -  Silent Auction items pickup. 6:00pm to 6:15pm -  Group Photo! Join us in front of Spangler for the group photo! Then head inside for awards! Weather plan: if we have rain, we'll do the photo at the SOUTH end of Spangler inside. Bring/borrow a chair or stand, we'll be taking the photo from the air so everyone can get in. No need to cram in the stands this year! 6:15pm to 7:00pm -  The Big Hug! Join us for awards & recognition! MWGB rolls on afterward so don't vamoose yet! 10:00pm to ?????? - [A51] Campfires transform to Area 51 for the last time of the event. Families still welcome but after 10pm it is up to parental discretion whether children should remain in attendance. Come hang out and enjoy the late evening with friends from all over! Free pancakes while supplies last! *Ice cream available while supplies last. ** As usual, all activities are tentative. Check back frequently for updates to the schedule. *** If trading is still going strong at Spangler Arena at night, etc. we will allow continued use of space as it makes sense and volunteer resources permit.